Pumpkin beer cocktails have sprouted at watering holes all over town. We’ve got two great recipes that use pumpkin beer or ale, plus tips on how to dress up a regular brew in seasonal flavors. Even people who aren’t beer lovers can enjoy a beertail. As long as you like pumpkin pie, you’ll like these. First up is a beertail from OhSweetJoy.com. 1. RIM the glass, if using the pumpkin spice rim (instructions below). 2. ADD the ingredients to the glass, giving the beertail one gentle stir so as not to break the bubbles. 3. GARNISH with a cinnamon stick (if not using the spice rim). 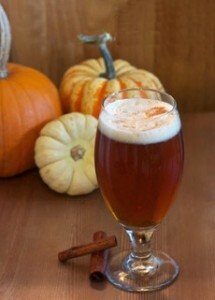 Turn a bottle of pumpkin beer or ale into a fall “beertail.” Photo courtesy OhSweetJoy.com. 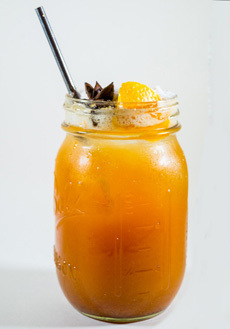 This second recipe, from Herradura Tequila, combines vodka with pumpkin ale, canned pumpkin and orange juice. If you don’t like vodka, you can substitute apple brandy, spiced rum, even a split between plain rum and hazelnut liqueur, like Frangelico. This is a sweet cocktail, so test the recipe first. You can omit the agave if it’s too sweet for you. Punch is a general term for a broad assortment of mixed drinks, made with or without alcohol. While punch generally contains fruit or fruit juice, fruit isn’t essential. Nor is an elegant punch bowl required. A pitcher is fine, and in many cases, it’s more practical. Punch was discovered in India by the British sailors of the East India Company. The concept was brought to England in the early 17th century, some 150 years before sparkling beverages were available to replace the water. From there punch spread to other countries. Carbonated water wasn’t available commercially until 1783. Then, J.J. Schweppe developed a process to manufacture carbonated mineral water, based on the the process discovered by Joseph Priestley in 1767. The word “punch” derives from the Hindi word, “panch.” In India, panch was made from five different ingredients: sugar, lemon, water, tea or spices and an alcoholic spirit. The word for “five” in Sanskrit is panchan; hence the name. 1. FILL a cocktail shaker with ice cubes and all ingredients except the garnish. Shake and strain into a glass filled with ice cubes. NOTE: We made multiple portions in a pitcher with pre-chilled ingredients. Instead of shaking, we whisked the ingredients in the pitcher. We then dropped an ice “hockey puck,” frozen in an empty soup can, into the pitcher. The larger the piece of ice, the slower it melts. 1. COMBINE the sugar and spices in a saucer or low bowl. Moisten the rim of the glass with water. 2. DIP the moistened rim into the spice mix and twist to coat. Top with a dash of pumpkin pie spice. Garnish with an apple or pear slice. Spice up with a cinnamon stick or star anise. Skewer candy corn onto a cocktail pick. *Reposado tequila, aged up to a year, takes on a light yellow and more complex flavors than blanco, or silver, tequila. Given the number of flavorful ingredients in this drink, you can substitute blanco if that’s what you have on hand.